The largest state in Australia is Western Australia. One third of the total size of Australia, it has an area of more than 2.5 million square kilometres. 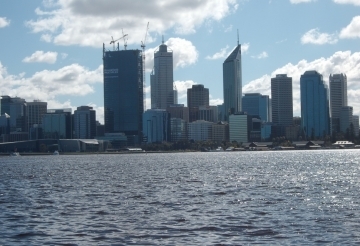 Perth, the capital has over one million people and is known as one of the most beautiful cities in Australia. The moderate climate and the laid back lifestyle make it a highly desirable city. Perth is located between the Darling Ranges and the Indian Ocean, lying 12 kilometres from the mouth of the Swan River, so named because of the huge amount of black swans that can be found here. 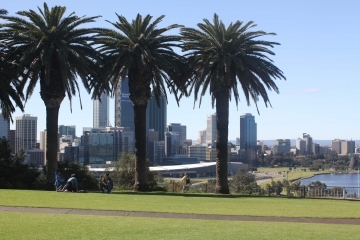 West of the city is more than 400 hectares of natural Australian bush which overlooks the city and the Swan River. King's Park offers unique views over the river and across to the city. From this vantage point you can see the many ferries on their way to Rottnest Island. 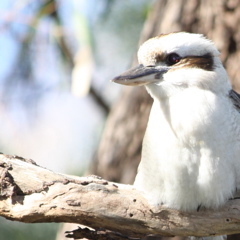 The botanical gardens offer a wide selection of native plants and flowers as well as exotic bird life including kookaburras and parrots. The spectacular walkways allow you to take in the views at every point. You can experience the glass sided bridge that feels as if it brings you closer to nature itself. As you walk through the gardens there is a huge memorial that burns the eternal flame. This gives the experience a very emotional, historic feeling and is a must for visitors to Perth and King's Park. Perth's port is Fremantle a very old city with lots of heritage buildings lining the streets. You could be forgiven for thinking you were in a big country town with the old style shopping along the streets, and lots of restaurants and cafes are scattered along the footpaths. Fremantle markets are always popular with tourists and locals and definitely worth a visit they are undercover and offer a huge variety of products from gifts to clothes, designer made and locally made items as well as a huge produce area. Parking in Perth and Fremantle is terrible....VERY difficult and usually only available in pay car parks. Check when booking your accommodation – you will find that most hotels will charge extra for parking, which will raise your daily rate significantly. Street parking is very limited and usually only short term. A short drive will also take you to the Mundaring Weir where you can enjoy a day at the dam with picnic areas and spectacular views. The water from the Mundaring Weir is not used for the Perth residents; it is actually pumped 600km inland to supply water to Kalgoorlie and surrounding goldfields. If you have the chance to take a drive through the Perth Hills it would be worth your while. Apart from the views over the city, the river and out to the ocean, the little townships are quaint reminders of the early history of Perth.Most still in their original glory it's like stepping back into history. There are museums and stories from the locals that are truly amazing. The remnants of the old railway lines that were the life line of the early settlers can still be seen throughout the area. Houses scattered through the hills blend into the environment and provide residents with a quite peaceful haven to enjoy. 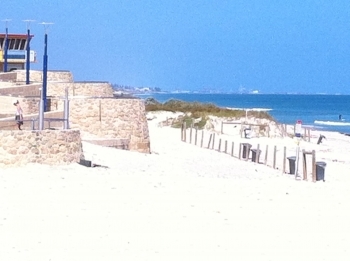 Mandurah is a beautiful little place on the ocean about an hour south of Perth. The town attracts tourists and weekenders with its beachside atmosphere and holiday feel. There are several really nice places to stay and one that we found was awesome was Seashells Resort. This resort is relatively new with and situated right on the beach. 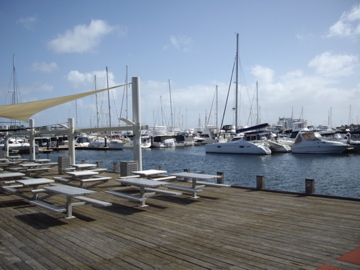 Located within walking distance to the marina and shops and cafes it would be one of the best in the area. The rooms are self-contained apartment style, upmarket and spacious. Full kitchen facilities are great for families, lounge and dining area and even an ensuite with spa bath. 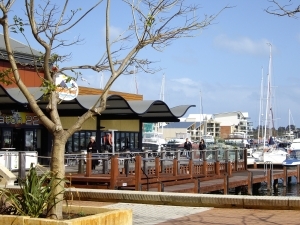 It also has a modern marina precinct with an abundance of restaurants, hotels, gift stores and an all-weather market area, which is an enticing way to stretch your legs and spend a relaxing afternoon. Mandurah has some really upmarket canal estates with big houses and marina berths. Lots of boating people are attracted to this area, it reminds me of a new "Gold Coast"
Travelling south towards Margaret River is a gorgeous eco Villa resort set overlooking the ocean in a natural bushland setting. The ambiance of the place is peaceful and relaxing. Some of the Eco Villas are set up to accommodate two couples and are well laid out for privacy and personal space. Both bedrooms are large with their own bathroom attached (one with spa bath). The villas are spacious and the timber throughout gives it a warm feeling. The resort reception area, lounges and dining area have that same warmth with the timber feel throughout the resort. Swimming with dolphins is a popular Western Australian marine experience. The warm waters are teeming with friendly bottlenose dolphins, who love to swim by and say G'day to their two-legged mates. These playful mammals will delight and amaze with their grace, serenity and mischievous shenanigans. You can spot them leaping through the air all along the pristine coastline, but for one-on-one interaction your best bet is Rockingham, Mandurah, Bunbury or Monkey Mia. The protected bays and islands of Rockingham are home to over 260 wild dolphins which local cruise operator Rockingham Wild Encounters has been visiting for over 20 years. Visitors are taken on a unique 'swim with wild dolphins experience' by crew using underwater aqua scooters to glide effortlessly amongst the dolphins. Other local cruises which explore the Shoalwater Islands Marine Park give visitors the opportunity to observe the dolphins and visit Penguin Island, home to WA's largest colony of little penguins. Cruises operate daily from mid September to early June. Further south in Bunbury, the Dolphin Discovery Centre is home to around 90 bottlenose dolphins and is one of the few places in the world where wild dolphins freely visit the beach to interact with humans. Join the Dolpin Discovery Centre Dolphin Swim Tour for an intimate swim with wild dolphins in their natural environment and swim on the wild side. Visitors can float and snorkel with dolphins, or cruise out to watch them swim in open waters. At Monkey Mia, 850 kilometres north of Perth, a small pod of dolphins regularly swim into the calm shallows to snare a feed of fish from the hands of specially trained rangers or visitors lucky enough to be chosen. In this picturesque and isolated corner of the globe, dolphins and humans have been mingling for more than 40 years. In Mandurah, you can take a dolphin sightseeing cruise and watch pods dance and play around the boat. This mutual curiosity has earned Western Australia a stellar reputation for providing some of the best wild dolphin experiences in the world. Arranging a swimming with dolphins tour is a WA must-do experience! YOU can't go to Paradise but you can pass close by. And if the spring light is right and dapples the trees in all shades of yellow and green, you may think you have arrived. This is a part of the world where things are not quite what they seem. Paradise isn't a precise dot on the map yet Gnomesville - remarkably, where gnomes actually live - is real. No need to take a tablet and have a nice lie down. If you take a trip through this compact section of Western Australia's southwest, there are such surprises at most turns in the road. The Ferguson Valley is a fertile east-west trench sliced through the earth, opening at the quaint town of Dardanup in a meander towards Lowden or, depending on the turn, Wellington Dam. It has been farming country since 1838, when settler Thomas Little arrived under the direction of Charles Princep of India to establish a horse-breeding venture to supply India. The venture failed but Little stayed on, establishing Dardanup Park farm and, as a staunch Roman Catholic, attracting an Irish Catholic community to the area. The early settlers in the district were farmers leading a largely subsistence living. Some produce, such as vegetables and meat, was sold to the Bunbury township, about 15km to the west. So not a lot has changed. Ferguson Valley remains a food haven and, to the road traveller, scenic drives through an area renowned for its arts and crafts, wines, beers, cheeses and pastries. It also has bed and breakfast accommodation. This all melds at the annual Bull and Barrel Festival held each October to celebrate the area's dairy and wine industries. If you start from Perth, allow a day for the Ferguson Valley drive. That will give time for a wander, some lunch and a return. Dardanup to Perth is 180km, which equates to a leisurely 2 1/2 hours. Our drive from Perth in a Volkswagen Touareg diesel SUV covered 692km. The road from Dardanup to Lowden is only 30km. But it's a slow route thanks to its twisting and undulating path that follows the Ferguson River through farmland, past vineyards and orchards. Most of the road is 80km/h and the double-white line ensures there's no passing - so if you cop a tractor, be patient. It passes the Moody Cow boutique brewery and the Aidan, Carlaminda and Hackersley Estate wineries and crosses the 600km Perth to Manjimup section of the Munda Biddi off-road cycle trail. This trail will extend to Albany next year and then claim the title as the world's longest, continuous, off-road cycle trail. Gnomesville - see, I wasn't kidding - is merely a roundabout on the Upper Ferguson Rd on the way to Lowden. Some time around 2000 someone either made a home for an unwanted suburban garden statue or one world-weary gnome found his final resting place. Since then, about 3000 concrete gnomes have been placed by the side of the road. Most come from Australian homes but many are from overseas visitors. The site is frequented by travellers drawn to the peculiarities of the display and some because of the publicity in 2007 of the "Gnomesville Massacre" - the result of vandals attacking the community. The drive from Gnomesville to Lowden is about 6km but is set high on a ridge overlooking farmland. Optional is a drive back to the Wellington Forest Discovery Centre - about 4km of mostly gravel road - which displays information about the jarrah forest and has details of a self-guided walk through the forest. The loop road then passes the Wellington Dam - with a kiosk and picnic areas - then the Collie River and Honeymoon Pool, a pretty camping and picnic area on the river that has a cafe, toilets and tents-only camping. This drive is about 20km and returns to Pile Rd to link back to Dardanup. Pile Rd has adjoining mountain bike trails, the Wild Bull boutique brewery and five wineries. And Paradise? You probably don't need to go there because Ferguson Valley is about as picturesque as WA's southwest gets. But for those who have never seen it, Paradise Rd is about 8km northeast of Dardanup. The best eating spots in Perth.